British luxury fashion brand Burberry has chosen a Facebook campaign over glossy magazines to promote the global launch of its new fragrance, according to this article in the Financial Times. The company has revealed that it now devotes over 60 per cent of its annual marketing budget to digital media, over three times the market average. This goes to show that the luxury industry is moving away from traditional print media in a bit to engage with a growing number of tech-savvy, global luxury consumers. I have written previously about the need for luxury brands to be innovative, creative and at the cutting edge of technology if they are not to fall behind in an increasingly competitive market, and Burberry is just one example of ‘traditional’ brands embracing digital means of marketing. British luxury brand Burberry last year launched its Burberry Bespoke service, which will allow consumers to select a made to measure trench coat, from the choice of fabric and its colour to the style of buttons and lining. Burberry has promised this will allow over 12 million variations of design – and price. With the rise in mass production replacing craft production as the dominant form of process in the luxury goods market, the voice of the individual consumer was limited to deciding which of the products on offer they would purchase, and not what the product should be in the first place. The Burberry Bespoke service illustrates a new turn in production referred to as “mass customisation”. This customisation seeks to restore individuality to the design process. It achieves this through involving the consumer in choices – what colour should the product be? What additional features? What design, pattern or print? – resulting in a product which is effectively made to order. Another example of this “mass customisation” might be Louis Vuitton’s Mon Monogram service, which allows consumers to monogram the ubiquitous design with their own initials. This also applies to clothing, where an approach that is individual led may be more favourable in terms of getting the perfect fit. I have written before about the difference in Theta and Lambda personalitites; the Theta seeking affiliation and control, and the Lambda seeking uniqueness. Lambda types are more likely to select products based on their individual responses to it, how it helps them to stand out, and how the product benchmarks against their regular consumptive patterns. Mass customisation is likely to appeal to Lambda personalities as they navigate the luxury market, with the opportunity to mark their choices as theirs and theirs alone rather than following the crowd. The high-end luxury market is booming, and emerging market tourists are to thank for this. I have written before about how consumers in emerging markets are helping the luxury market to recover from its worst slump in decades, and also how brands are eyeing up ways to attract Chinese shoppers online. Now luxury fashion brand Burberry has announced that its annual profits will be at the top end of market expectations, thanks largely to Chinese tourists. The brand, which counts six UK stores as well as concessions in Selfridges, Harrods and Harvey Nichols, posted a 27 percent rise in third-quarter sales to $480 million. Of this, there was a 68 percent revenue growth from Asia Pacific, bringing in £150 million. Last September, the fashion house acquired 50 franchise stores in China, and wants to increase that to 100 over the next five years. In the UK, revenues were lifted by the flow of overseas tourists to London. While the Chinese were the biggest spenders in the Burberry UK shops, they were closely followed by visitors from Russia, the Middle East and Continental Europe. Burberry has a 155-year record of making raincoats and handbags, whose trademark camel, red and black check pattern is synonymous with the image of wealth, tradition and heritage. Looking towards the future, things look bright. Chief Executive Angela Ahrendts said, “Ongoing initiatives in retail, digital, product development and new markets underpin our confidence in the future.” The brand has plans for a digital store format, that will be unveiled shortly, to attract its customers in China. Whilst many other luxury fashion brands are struggling in today’s economic downturn, British brand Burberry is enjoying a renaissance, seeing its best sales in over a decade and with shares up over 3 per cent. This was evident last night when the brand hosted its first catwalk show during London’s Fashion Week in a decade, which was attended by a strictly A-list fashion crowd including Victoria Beckham, Gwyneth Paltrow and Anna Wintour, giving it the industry stamp of approval. 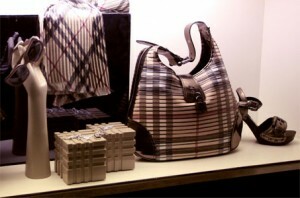 Many luxury goods brands are now likely pulling their hair trying to figure out the secret to Burberry’s success. My guess includes a mix of smart positioning and strong heritage. As many customers now are looking to invest in fewer classic pieces that last, rather than outrageous designs that will see you through a season, Burberry has wisely focused on reminding customers of its heritage. It is also keeping its famous trench coat at the heart of its collection, altering it just slightly to keep up with fashion’s prevailing mood. The diamond industry is in love with Tiffany. Witness this analysis from Diamonds.net of the way that Tiffany avoided ‘doing a Burberry’. In 2002, with $120 silver bracelets rushing off the shelves, Tiffany’s CEO Kowalski raised the prices on all of its most accessible collections, including ‘Return to Tiffany.’ The increase was not a response to rising costs or a desire for higher margins. It was a marketing decision intended purely to reduce sales. This sounds like madness if you are a salesperson, but if you understand brand, and the difference between marketing and sales, it makes perfect strategic sense. Problematically, the price rises had no discernible impact on sales. So in 2003 and again in 2004, Tiffany drove prices even higher. Finally, with prices up by more than 30 percent, Kowalski achieved his goal: Sales of jewellery under $500 finally began to decline. Kowalski had saved his brand, increased his margins and build a sustainable platform the future. Burberry, Veblen Goods and the levers of luxury. It’s worth noting that a luxury good is not the same as a Veblen good–which is an item for which demand propensity of individuals increases in proportion to the good’s increasing price, named after the most influential micro economist Thorstein Veblen. There are two other interaction forces in play–whereby the overarching market conditions affects micro-economic demand. The first of these is the snob value of a good–whereby its actual rarity and exclusivity paradoxically increases individual demand cf.. louis vuitton or chanel handbags–and then the reverse social effect–the bandwagon effect, whereby individual demand propensity increases with penetration cf. makepovertyhistory wristbands. These can be seen as the effects of preferences for belonging on the one hand, and for exclusivity on the other. The interesting challenge for luxury brand owners is to predict the tipping point for these forces within their brand economics. Burberry’s growth worked brilliantly for a while under the bandwagon effect, but it hit a tipping point as these de facto status-seekers and conspicuous consumers were from a social class that many legacy brand disciples shunned – the so called chav contingent. The question is…could Burberry have reversed the bandwagon effect by apply the Veblen effect–raising the price to push out the downmarket social groups …or could it, paradoxically have reversed it be cheapening the offer–lowering the price to reduce the dissonance between the product’s pricepoint and its social status, and thus dampening the excessive consumption and damaging social prominence of its product? It is critical, even at an economic level, to recognise that socially-motivated, and challenge-motivated individuals will require different treatment.